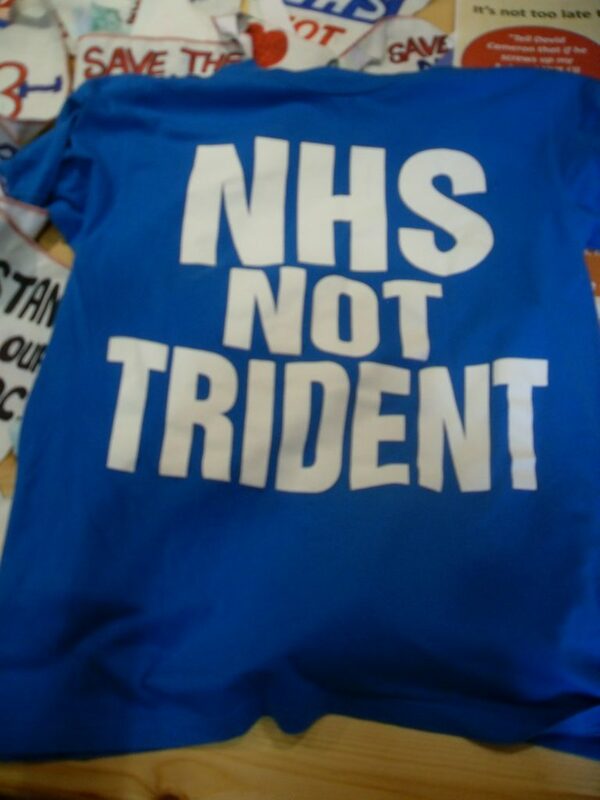 This t-shirt, collected by Leeds Hospital Alert, represents a long-standing comparison between the government spend on nuclear weaponry and the NHS. The medical peace movement dates back as far as the foundation of the Medical Association for the Prevention of War (MAPW) in 1951, and the Medical Campaign Against Nuclear Weapons (MCANW), founded in 1982. These groups were primarily composed of clinicians, but today calls for nuclear spending to be redirected are made by most NHS-campaigners, including Keep Our NHS Public. MAPW and MCANW, meanwhile, have merged in to 'Medact', which now lobbies not only around this issue, but also about human rights, climate change, economic justice, peace, and health.